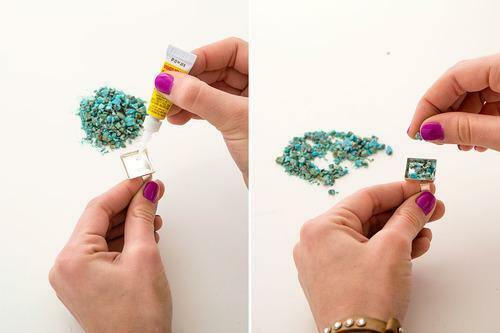 For our next trick of #31DaysofDIY we are going to show you how tocreate a simple stone inlay ring. To make a stone inlay you will need to use raw stones. 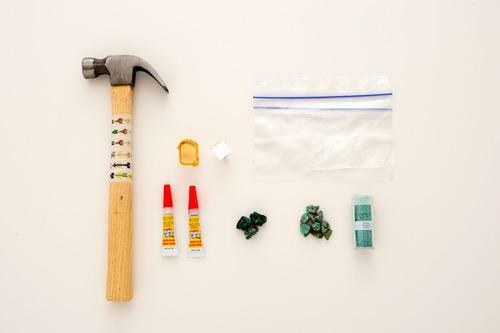 They can be precious stones, such as turquoise, or maybe just a dark black rock you found hiking this past weekend. If you are looking for a precious or semi-precious store call your local bead shop to see if they sell them. With normal stone inlay you would need to file the stone down to create a smooth marble looking surface. Let’s be real and realize that it’s no longer 1200 BC and no one has time to hand file stone. We kept the stone raw and textured which gave it more of a druzy feel, which we love. 1. 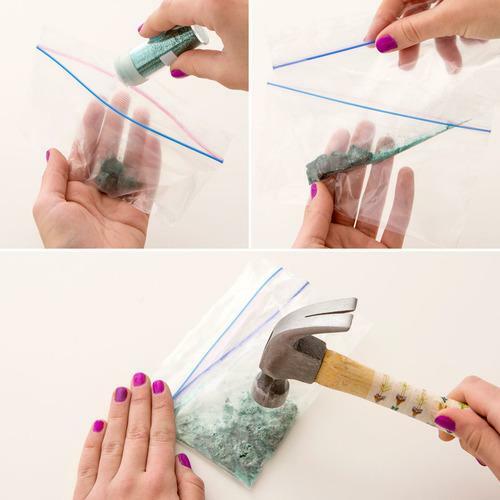 Place your raw stones into a plastic bag with a dash of glitter and smash it into tiny pieces using your hammer. 2. Fill your bezeled ring with super glue and start placing in larger chunks of stone into the ring. Then add another layer super glue and sprinkle in the finer rocks into the crevices. 3. Let dry and then rock that ring! 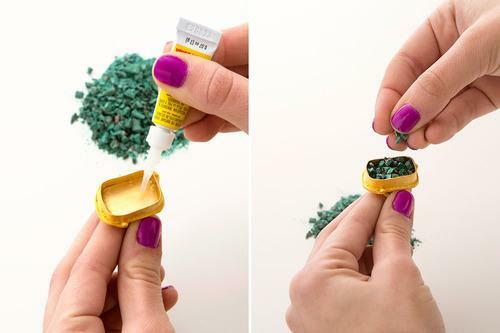 Place your stone into a plastic baggie and shake in some glitter. Just remember — the more glitter the more GLAM. Place that baggie into another plastic baggie. The stones are sharp and will easily rip the bag. By double bagging, the percentage of lost precious stone is much less. Now, hammer those stones! Squeeze out enough super glue to cover the bottom of your bezel. Next place in the larger rocks, trying to fill in all of the spaces. 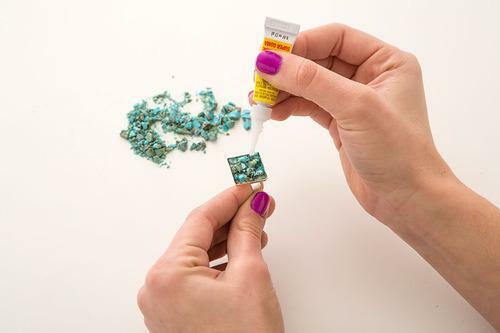 Cover the first layer of stone with super glue and sprinkle in the finer stone and sparkle dust. Time to let it dry. It will take about an hour to dry completely. 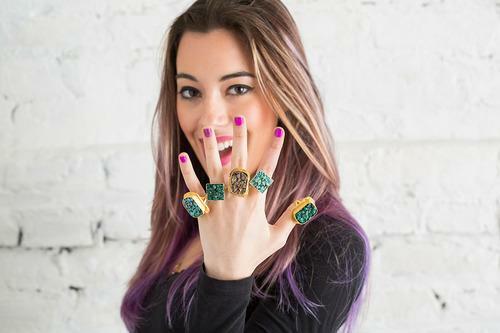 While we wait, let’s make another ring. These stones were a total score! 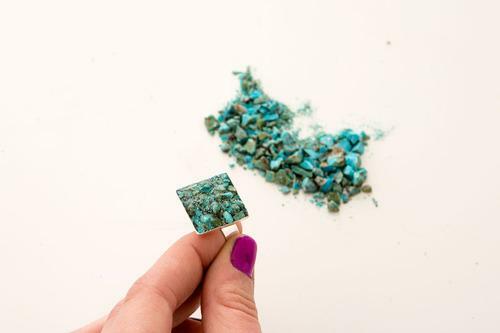 They are Malachite, which is a copper carbonate hydroxide mineral. All we know is that they are a beautiful deep teal and we are obsessed. This ring bezel was a total score. We ordered them off Etsy and got four for $8. 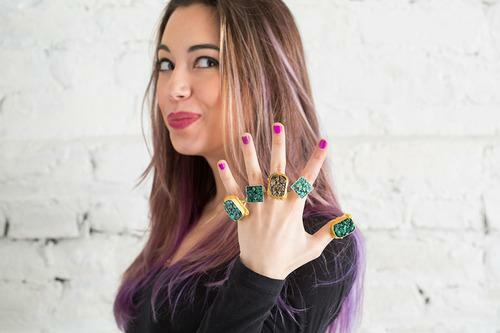 The deep malachite really pops in the rich gold metal. Repeat the steps from before. 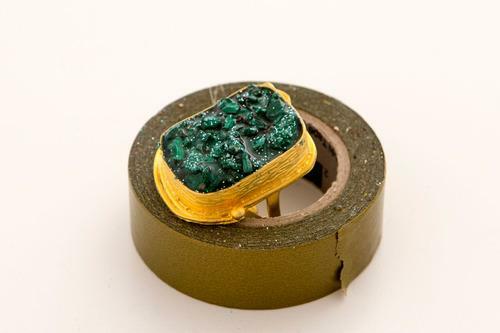 Add a layer of super glue to the bottom of the ring and fill with the larger chunks of stone. Top the bottom later of stone with glue and sprinkle the finer stones into the crevices. Let the ring dry for about an hour. If you find more of a dull stone, add extra sparkles to make it pop.